February 1904. 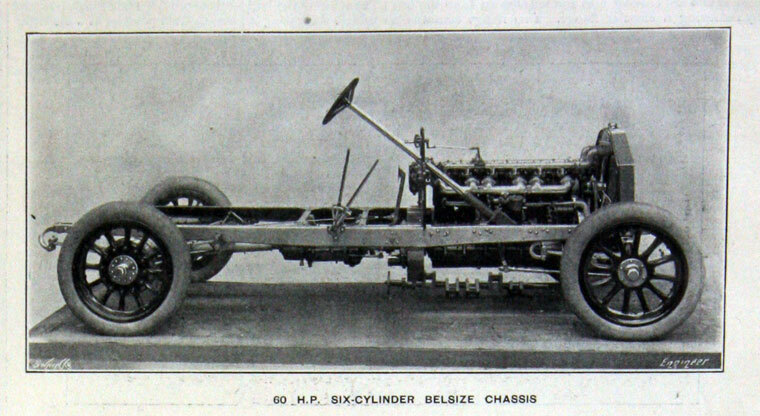 6 h.p. model. 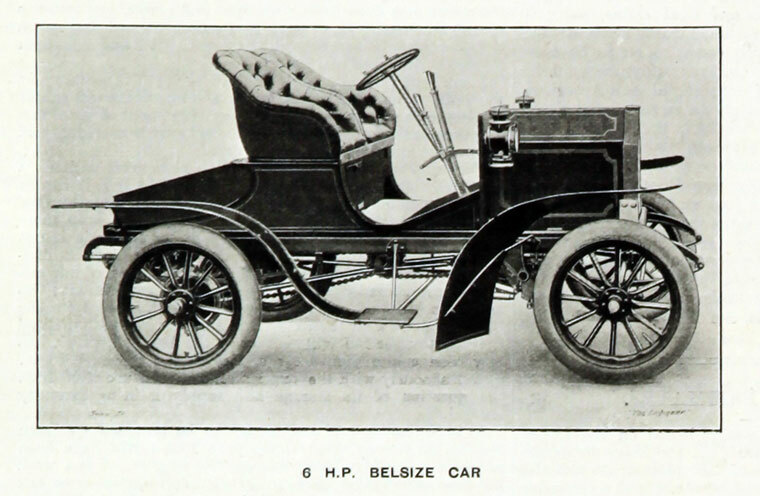 February 1905 18-24 h.p. 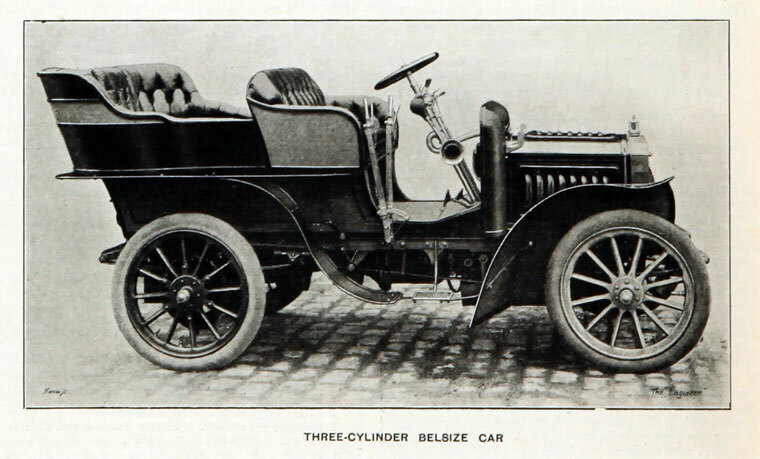 Three-cylinder. 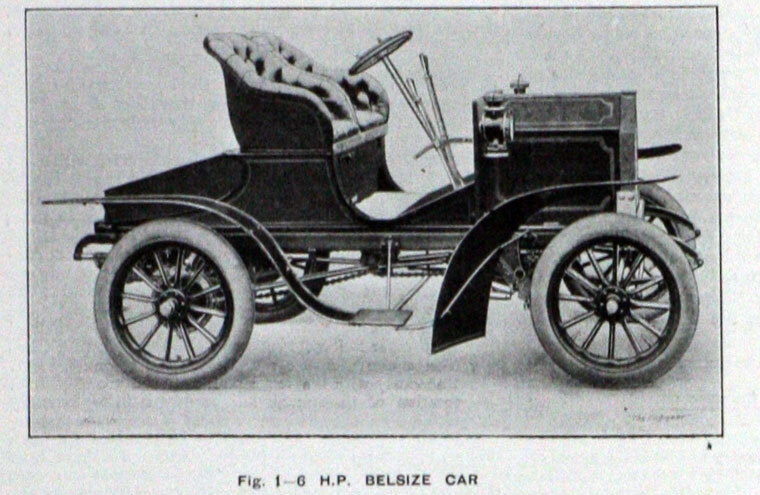 1906 Q4. 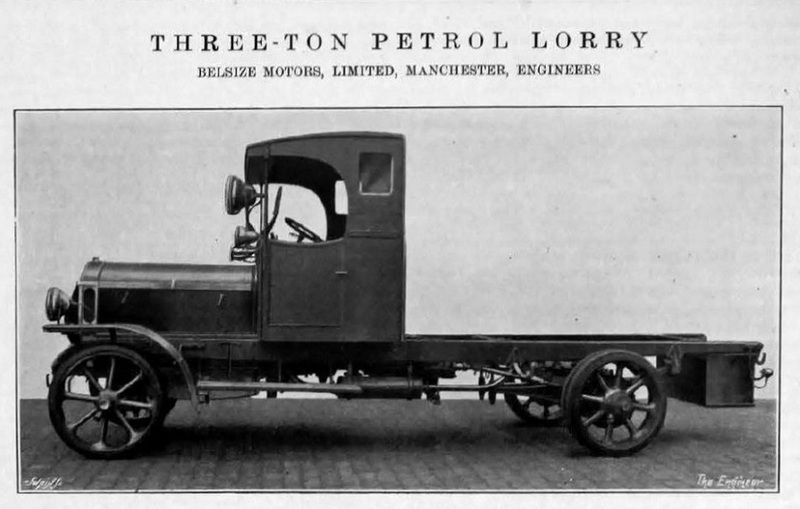 Thrupp and Maberly body. July 1908. 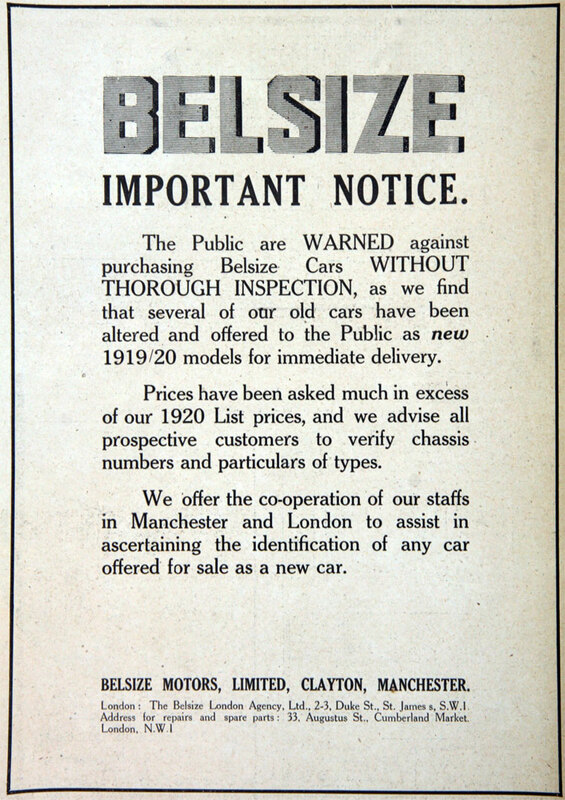 Advert for 20-30 h.p. 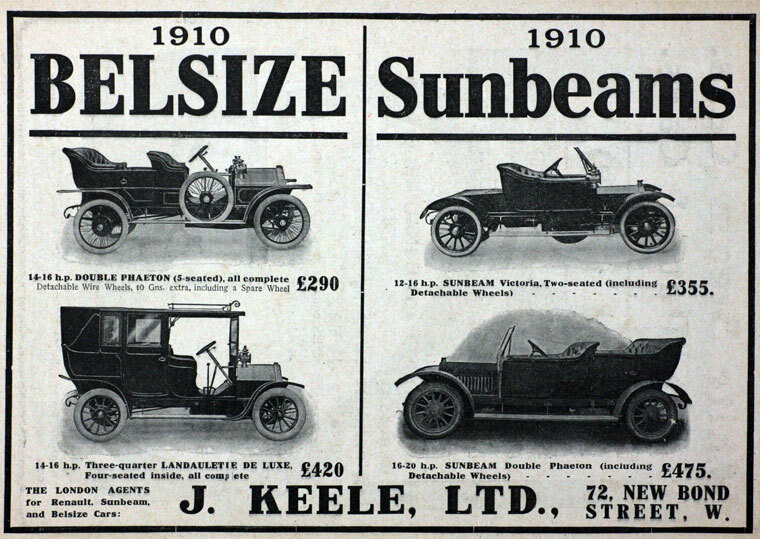 July 1908. 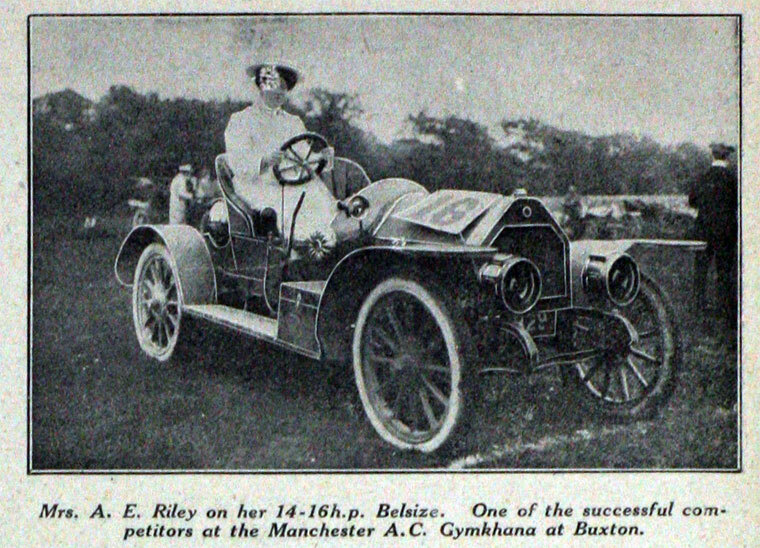 Mrs. A. E. Riley in her 14-16 h.p. 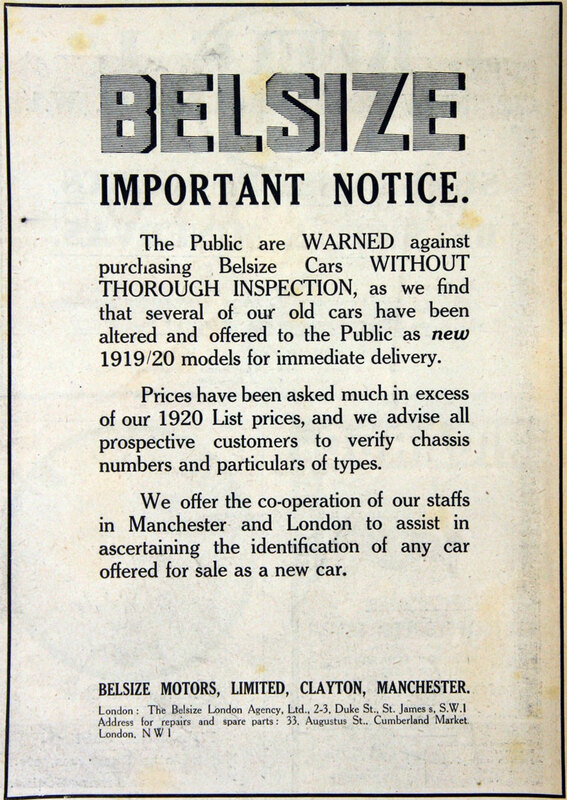 Belsize. 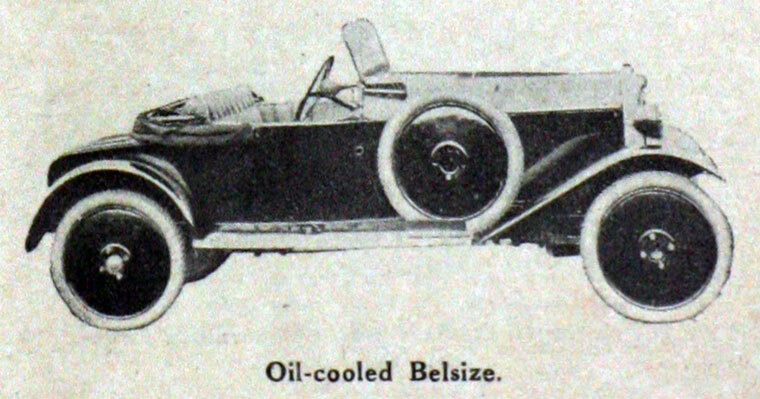 June 1912. 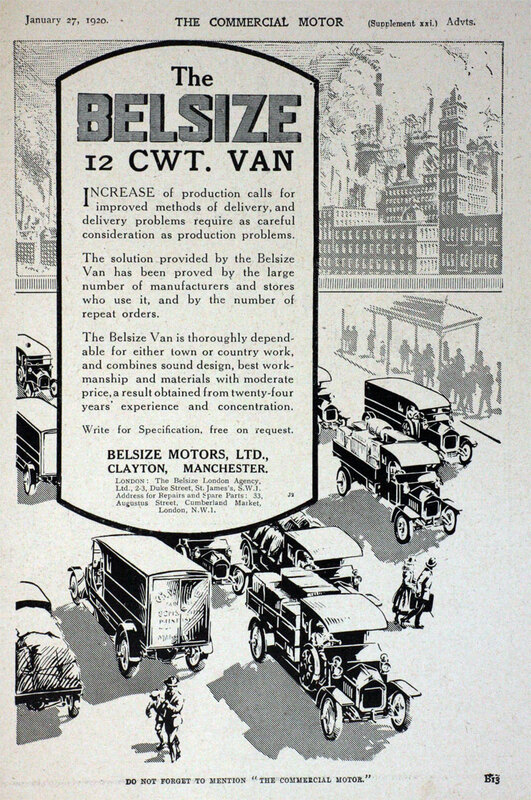 Belsize Motors 30-cwt can for John Mark and Co.
February 1914. 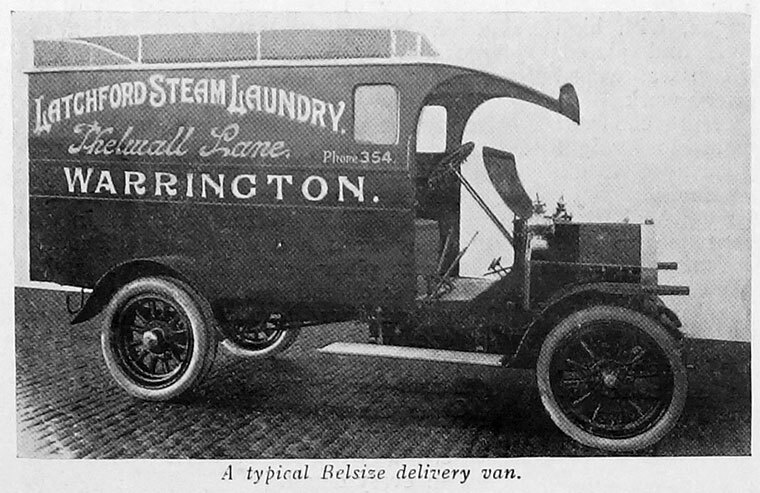 Belsize Motors delivery van for the Latchford Steam Laundry. 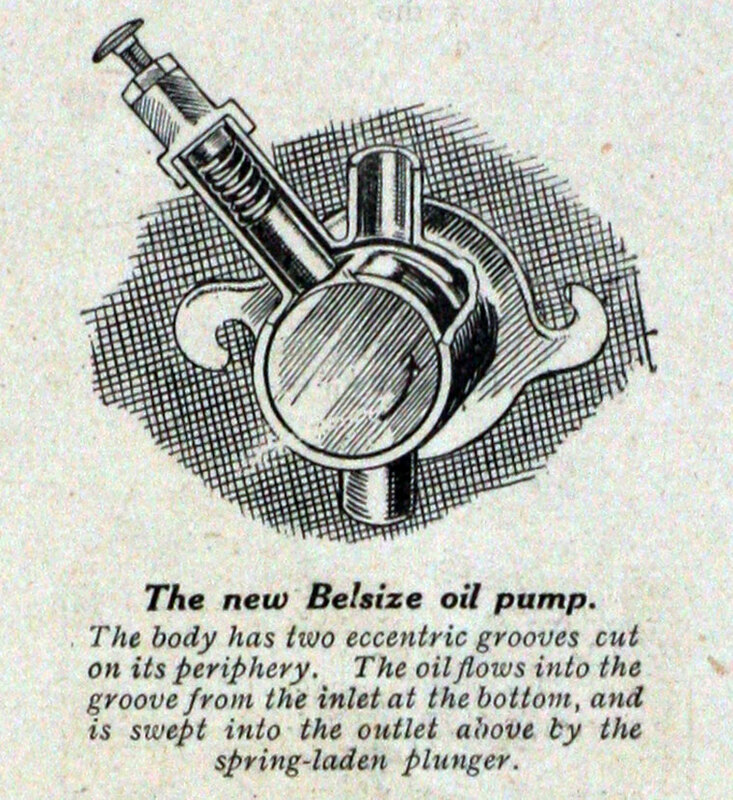 January 1915. 3 ton truck. 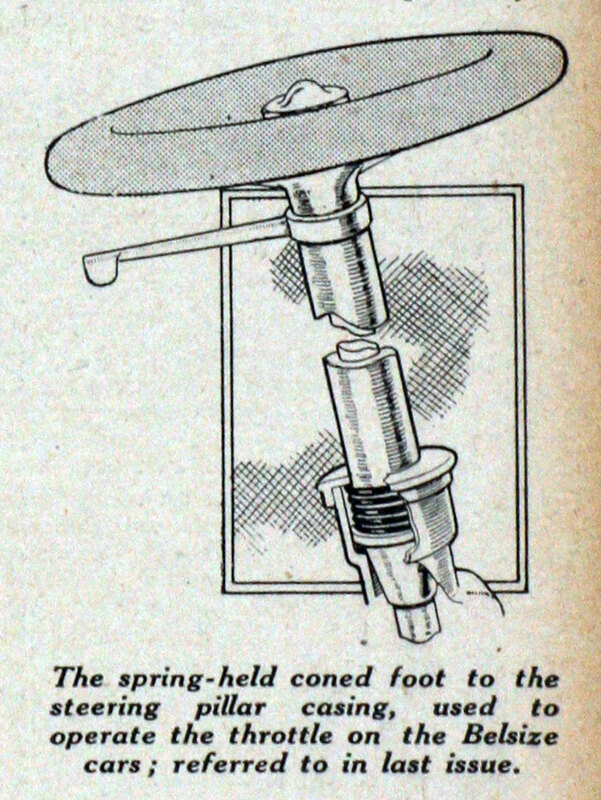 1902 February. 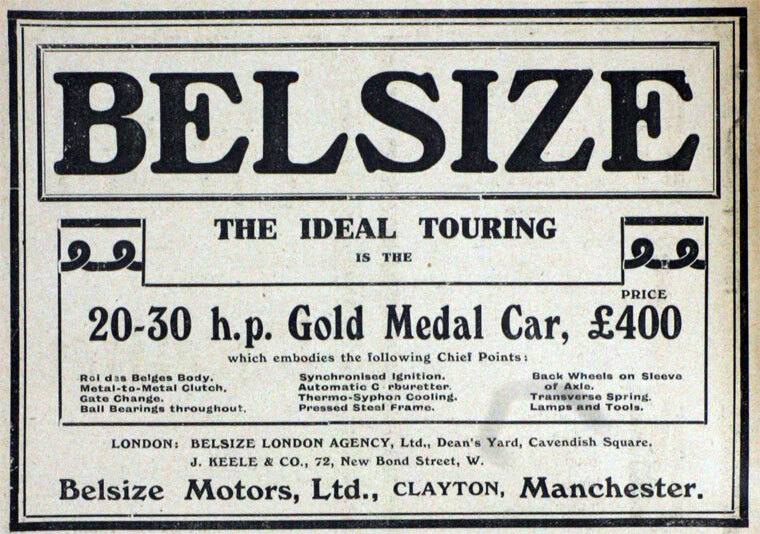 Details of the 12-hp Belsize car made by Marshall and Co.
1905 January. 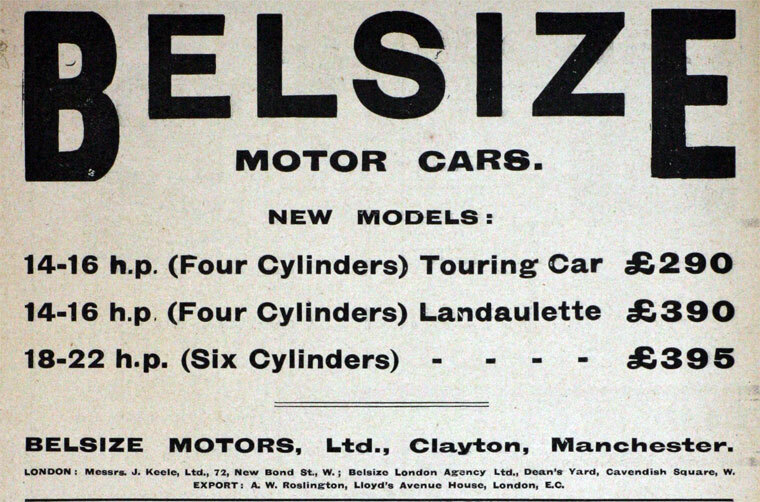 Details of their 6 hp, 18-24 hp cars. 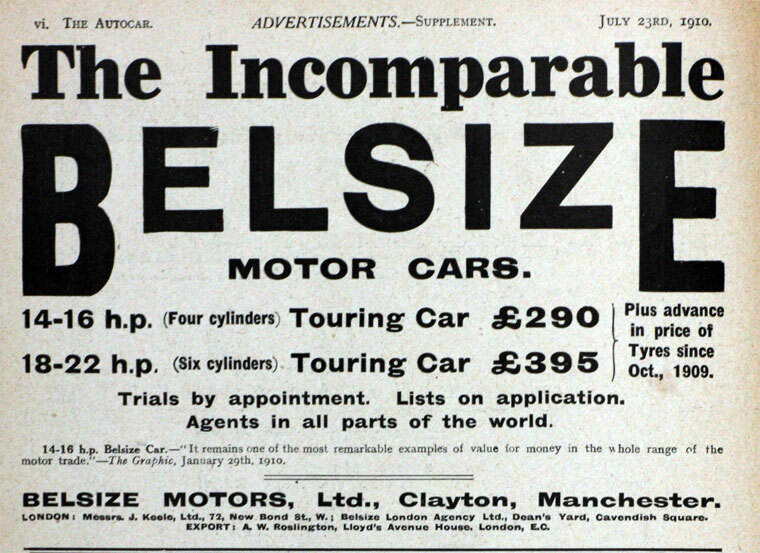 1905 January. 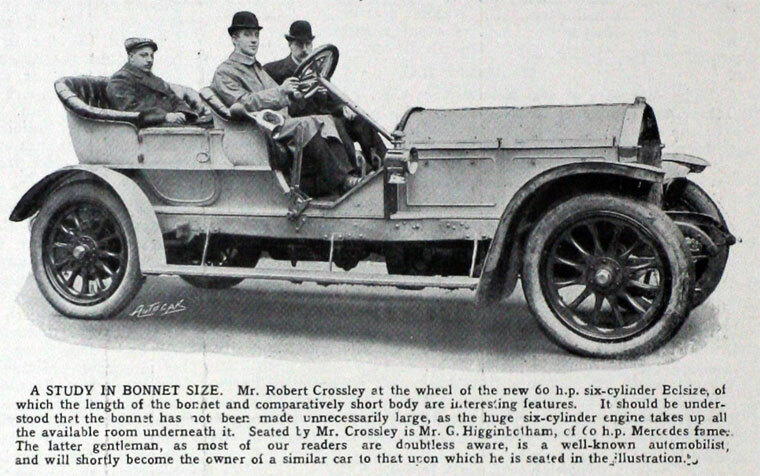 Details of the 18-hp car. 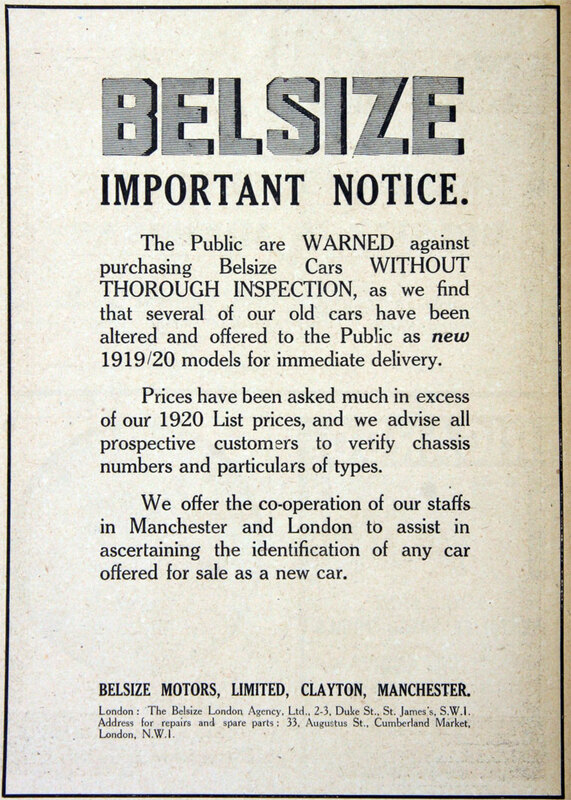 1906 This changed again to Belsize Motors Ltd. 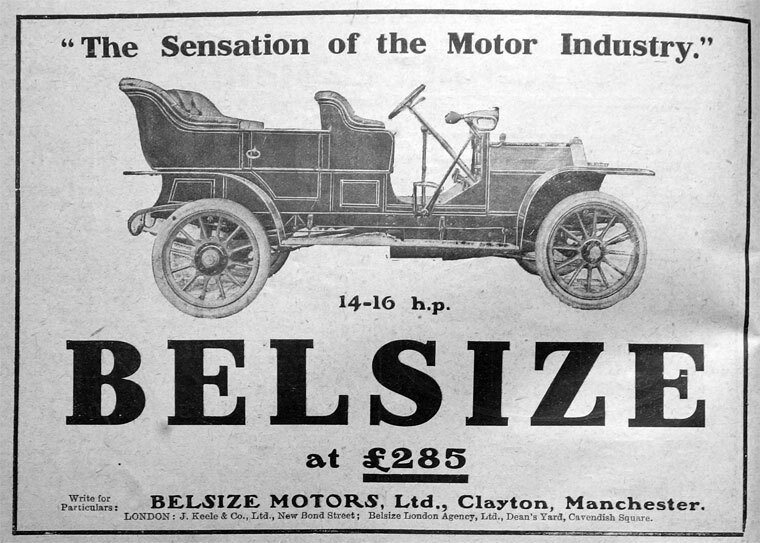 The company was registered on 20 April, to acquire the undertaking of the Belsize Motor and Engineering Co.  Directors were: George Pilkington Dawson, Chairman; James Barber; Gerald Higginbotham; John Whitehead; Colin Mather; and James Hoyle Smith, Managing Director. 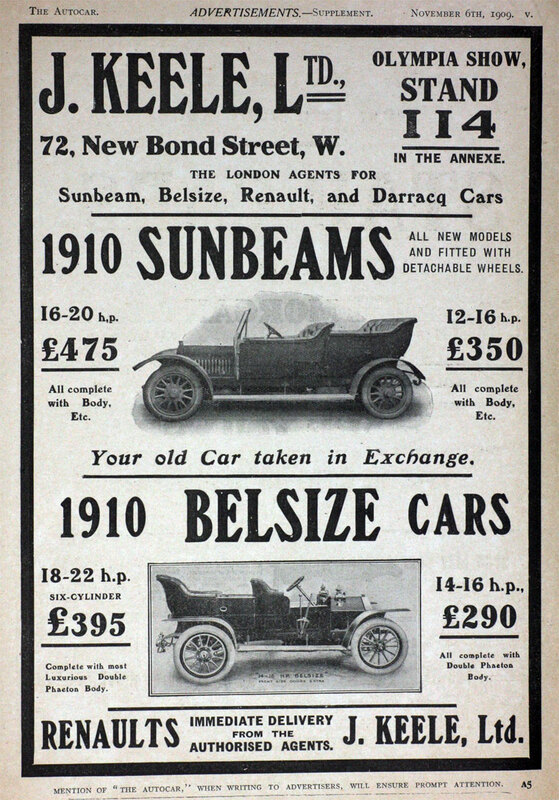 1906 Advert says details can be obtained from W. Bath and Son of London and King's Lynn. 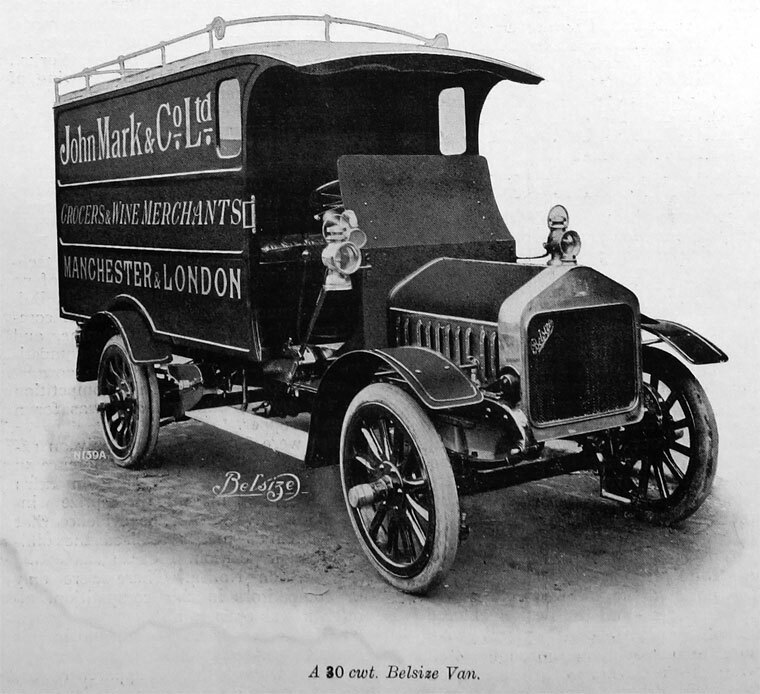 1906 March. 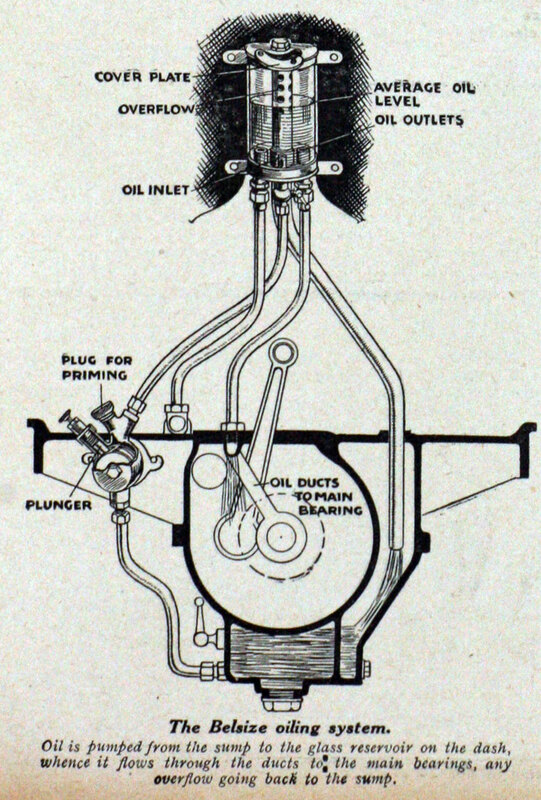 Details of the six-cylinder car. 1911 September. 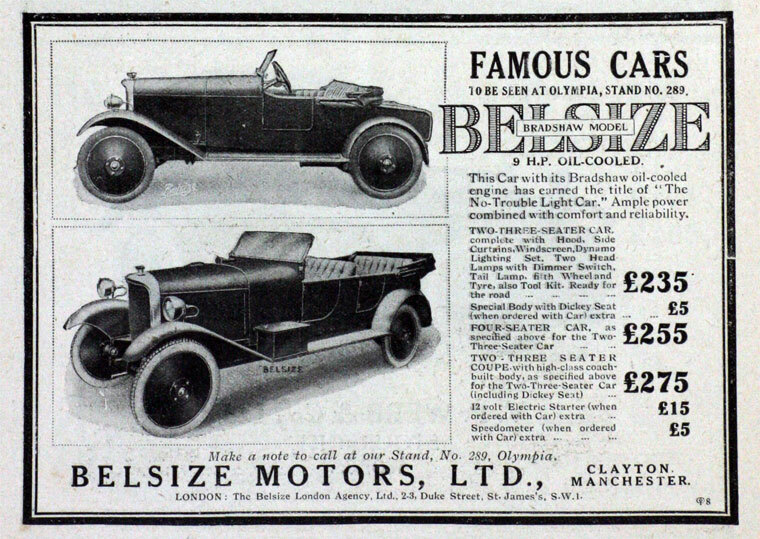 Details of the 14-16hp (four-cylinder) and 18-22hp (six-cylinder) cars and the new 10-12hp car for 1912. 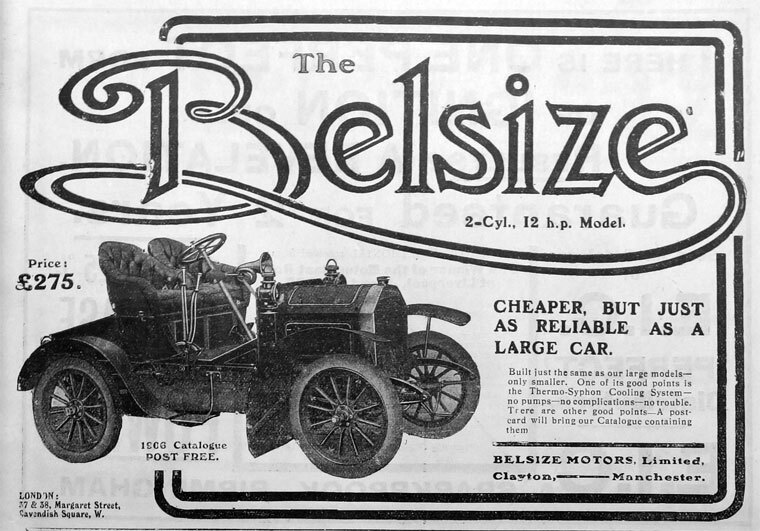 1912 January. 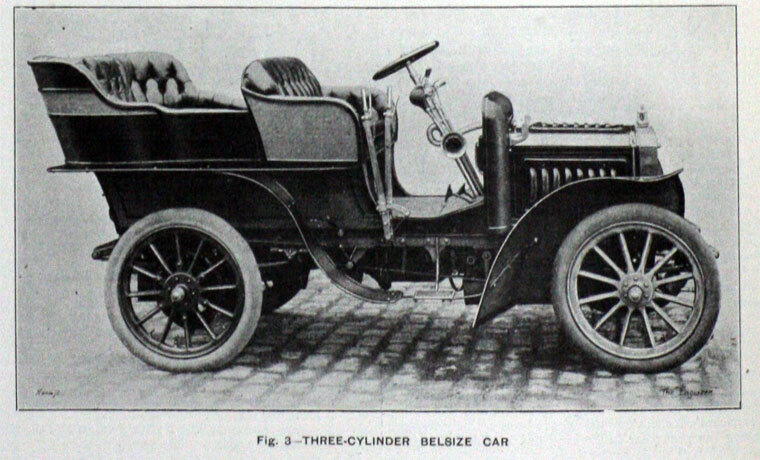 Details of the 10-12hp four-cylinder car. 1912 November. 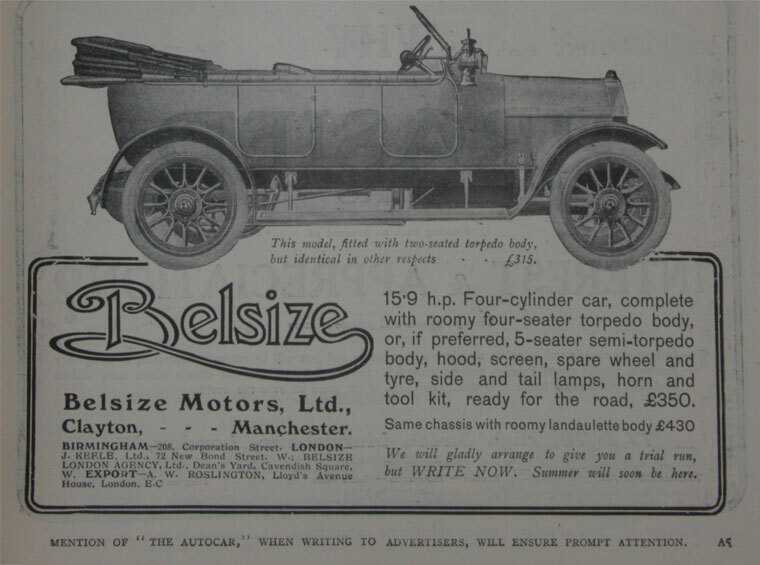 Details of the new 15.9hp car. 1913 November. 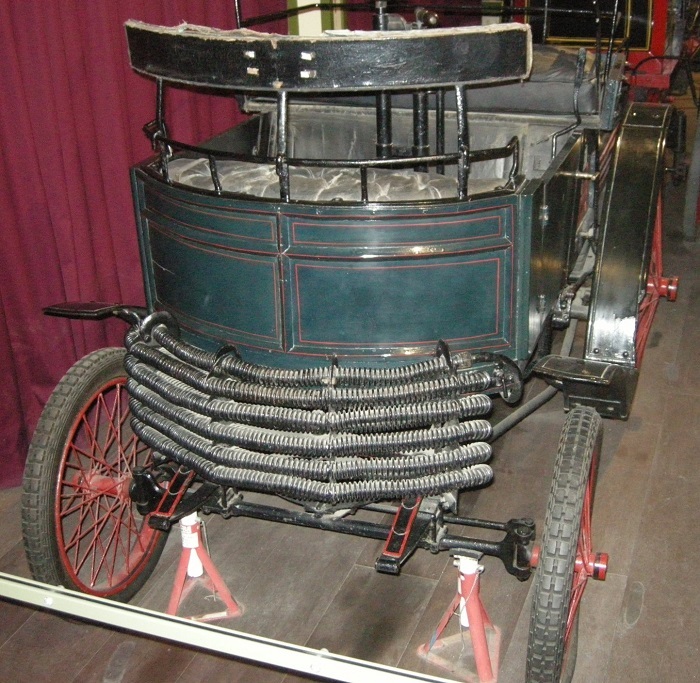 Details of the 10-12hp 15.9hp and 18-22hp cars. 1914 Directors: Jas. Hoyle Smith (Managing Director), G. P. Dawson (Chairman), John Whitehead, Colin Mather, Gerald Higginbotham. Staff: 1500. 1914 October. 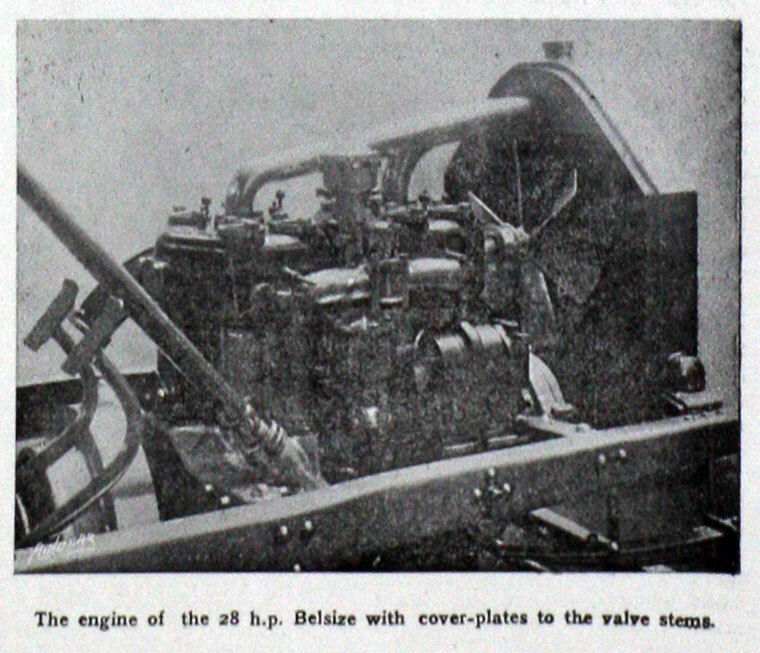 Details of the three models; new 10hp, the 12hp and 15.9hp. 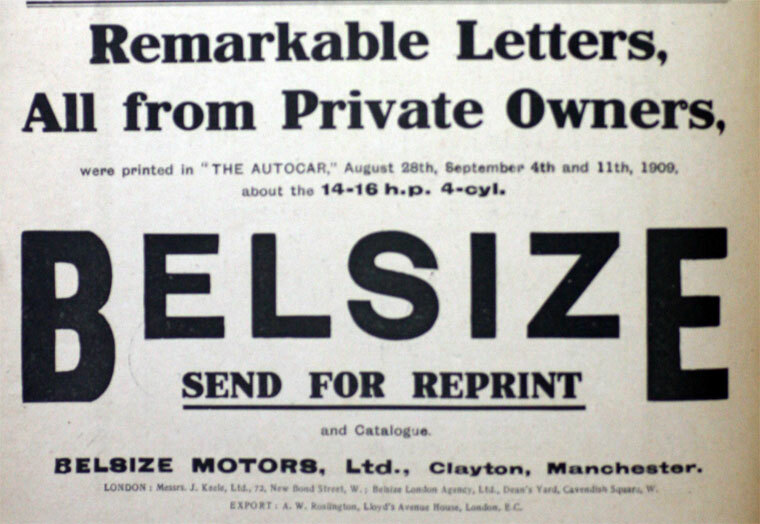 The company also tried to build a 2,496 cc, straight eight engine but this probably never got past the prototype stage although it was advertised at £1,050. 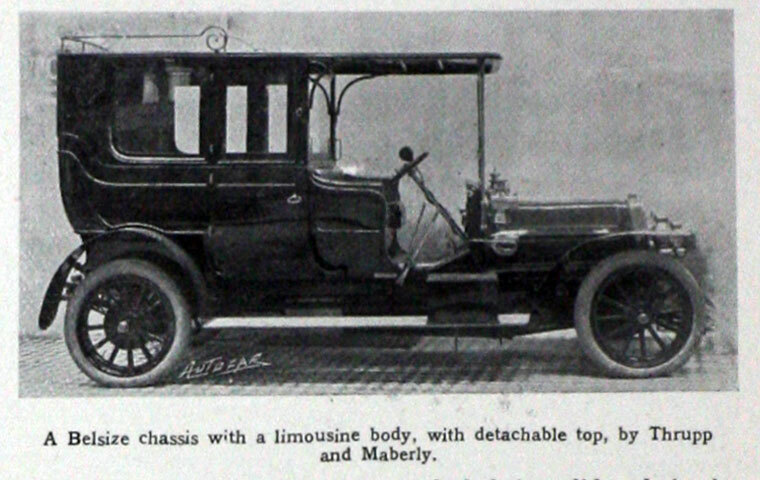 The 1905 O.S. map shows the factory on Clayton Lane, mostly housed in a single building measuring approx 290 ft by 150 ft., with an attached narrow building abour 20 ft wide and 180 ft long fronting onto Clayton Lane. 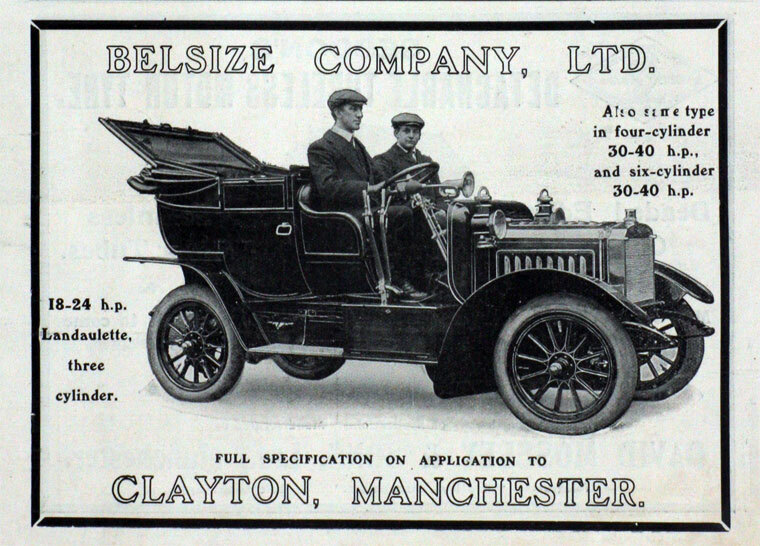 By 1911 the factory was over 7 acres in extent and employed over 1200 people in busy times. 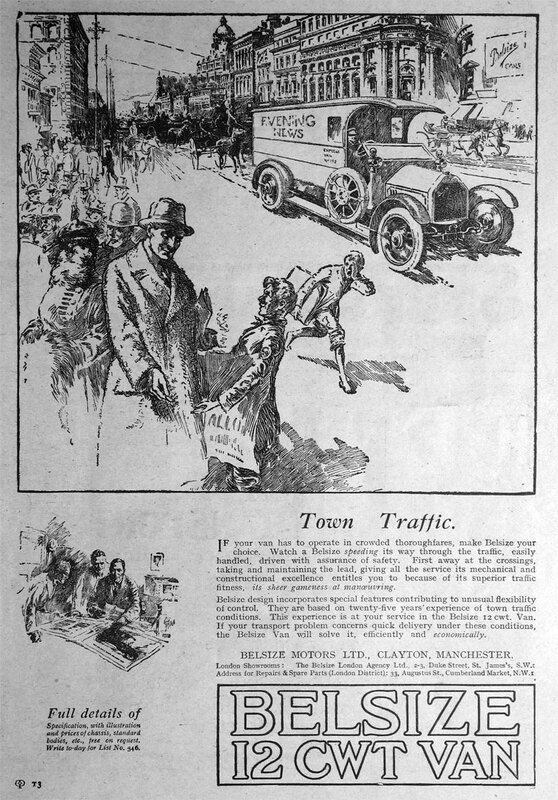 Part of the new extension consisted of 'that huge building formerly known as the Old Trafford Ice Skating Rink', re-erected at Clayton for building car and taxi bodies. 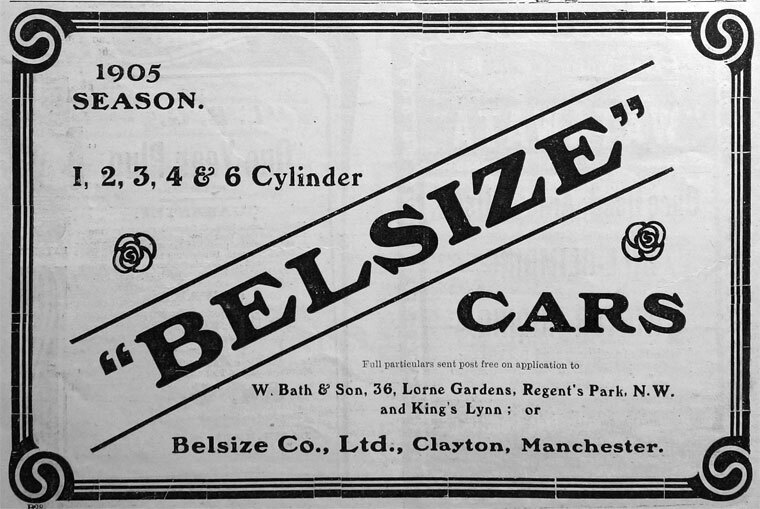 1929 Aerial photo here shows part of Belsize Works. 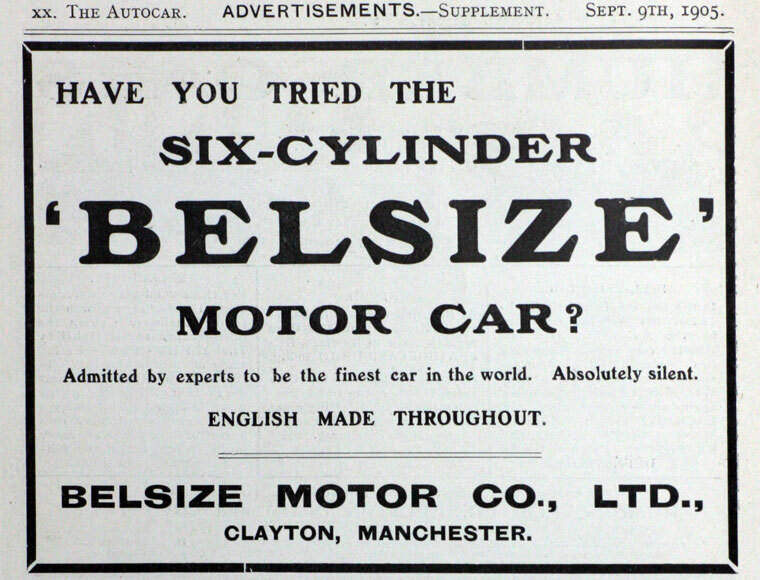 Note: The business evidently took over the Belsize Works formally occupied by the Manchester Cycle Manufacturing Co, but this could not have happened before July 1898, when the factory was advertised for sale. This page was last edited on 5 April 2018, at 00:33.